This is rather a funny hint and not a real secret. Hello Tenzin, it is not that funny really – the book has only just come out and has not yet been promoted in the mainstream. What it could also show is that people who usually read the Dalai Lama’s books (unlikely to be Geshe Kelsang’s students who are aware of the Dorje Shugden issue) are also reading ‘A Great Deception’. This shows that they are open minded and therefore capable of discovering the truth about the DL. I think I can say that things will only grow worse for the Dalai Lama with the publication of this new book. Your “quote” I deleted. If you can give a reliable source for this claim please name it. My blog does not support rumours and NKT propaganda. You have your own blogs for that. How many scholarly references do the authors of the books note? How many reliable accounts from well- known human rights organizations? Quotations from the Kangyur and Tengyur canons of Tibetan Buddhism? Accounts from non-Shugden and non-NKT commentators (excluding WSS paid lawyers in India)? Probably not many. This is nothing more than a cut and paste job of previously posted material from the WSS anti-Dalai Lama campaign. Hardly a reliable piece of scholarly material. Hopefully, others will make efforts to post reviews on the cite after looking at the material, as NKT seems to have dispersed its loyal members to post the first reviews in order to spread their campaign of hate against the Dalai Lama after unsuccessful picketing. Amazon.com deleted 2 times my reviews on the book. I guess based on the complaints by NKT. Amazon.co.uk did not delete the same review, but I decided to delete it myself yesterday. It may be better to be silent and to let praise them the book, this may say more than to say something. It would be easy to refute the book as non-sense but why investing so much time to untangle the spins of people who have chosen the Dalai Lama(s) to be their main enemy? NKT leadership and most NKT followers hold a concept of the Dalai Lama that evokes feelings of hatred or fear, the book is just an expression of it. It is as it is. As with TP, Khedrup has not actually read the book, so speculating as to how scholarly and reliable the references are and concluding that they won’t be, is a complete waste of time. You are all commenting on something you haven’t read, so you’re not qualified to comment at all. Come back when you’ve read the book and can put forward a coherent defence based on the actual subject matter. The truth is, you are either in complete denial about the validity of the material (and it is valid) out of blind faith, or you simply want to disparage the book so that no one will read it because you fear what it says and what the implications will be when the world’s media realizes the truth about the Dalai Lama. No one has chosen the Dalai Lama as their enemy. He’s not my enemy but a poor, misguided sentient being, however we can definitely say there is no one in this world at this present time who is harming the Buddhadharma more than the Dalai Lama and his political actions. Let the truth be known! May the Buddhas and Bodhisattvas bless your mental continuum to see the truth and not to misapprehend delusions and wrong views to be the truth. I can only recommend Bell’s book, however, the spins you or WSS are making out of it are a shame for human intelligence. While Bell gives a neutral and accurate portray and has much respect and understanding for the Tibetan society, culture, Tibetan Buddhism and the Dalai Lama, you/WSS only pervert certain information he gives to fulfil your vision to portray the 13th Dalai Lama as a strange or vile non-Buddhist person. You/WSS focus on perceived faults and ride on them, you miss to see the qualities of the 13th Dalai Lama and the context in which he had to act. What you/WSS are doing has nothing to do with a Dharma approach nor in any way with a common sense approach, it’s mere black-and-white propaganda. I will not approve further propaganda links to your website, LH. You should notice that the book was published by wisdom publications http://www.wisdom-books.com/ProductDetail.asp?PID=1230 and as far as I know this publisher was founded by FPMT. Instead of focusing on perceived faults of the wise emulate them and don’t emulate the teachings that explain how anger, hostility and confusion arises by focusing on the faults of others. I’m sorry to have upset you, it’s simply the truth. The article, which is by emptymountains, not me, simply quotes from the book. There’s no spin in direct quotation. Surely you can’t object to the content of the book just because it doesn’t say what you want it to or what you think it should say? I think you didn’t upset me. to reject something does not necessarily include to be upset with it. however, I am sorry to have wrongly asserted that you wrote this piece. since the post appeared under “dharmaprotector” and emptymountains posted usually under emptymountains, I assumed it was written by you. There’s no spin in direct quotation. There are some quotations and emptymountains mixes his spins into it or do you want to tell me that Helmut Gassner or Tenzin Peljor, whom he mixes for instance into his quotes, lived at the time of Bell and what they claim are quotes from the book? Emptymountains and WSS completely ignore that Bell says clean clearly that the Dalai Lama was a good ruler on the secular as well as on the spiritual side. Bell lists also the accomplishment for the society the 13th Dalai Lama achieved. It is amazing to see how biased this book is read by NKT people. When I find time I will offer some quotes from Bell’s book of statements that have been deliberately ignored by NKT folk. To sum it Bell says that the 13th Dalai Lama was a good and selfless ruler, about whom can be said that he almost died due his extreme hard work in the service of his people. The 13th Dalai Lama fighted successfully corruption, was against mutilations, was “intensely human”, dispelled injustice increased justice, improved the educations of the monks and tried to establish also proper mundane educations (what has been undermined by the most conservative Gelug abbots and monks because they feared to loose power.) He weakened the power of the monasteries and helped the poor, he listened to his people and asked them about their opinion. He tried to open Tibet to other nations to protect it from a Chinese or foreign invasion. When he died the Tibetans were shedding tears because they realised what he has done for them and that he must – from their pov – be truly the Buddha of Compassion, hence they called him immediately The Great 13th and were lamenting about the loss when he died.. all this and other points are in Bell’s book. (btw only Shugden was happy about the 13th Dalai Lama’s death but this is not in Bells book this you can find in Pabongkha’s works). The 13th DL also saw the dangers of a takeover of Tibet by a foreign nation and tried to set up an army but also this was undermined by the conservative Gelug establishment. He predicted also the takeover if the Tibetans don’t change. What is not in Bells book, but shows the accomplishments of the 13th Dalai Lama too, is that the government went totally corrupt after his dead and the state of Tibet thoroughly degenerated under the Gelug establishment without a skilful Dalai Lama. I only glanced through emptymountain’s post. e.g. his argument that Bell says “only once” that the 13th Dalai Lama was a selfless ruler is ridiculous. Bell is clean clear about the Dalai Lama’s moral integrity. He also says that “Neither from Asiatics or European did I ever hear the smallest whisper against his moral character.” (p. 442) That WSS or emptymountains try to ‘prove’ that the 13th Dalai Lama lacked – or in general the Dalai Lamas lack – moral integrity and were somewhat ruthless and brutal dictators, is – I think – just an expression of their own lack of moral integrity, their extreme bias, and confusion. I perceive a thorough inability of NKT leadership and their ‘propaganda team’ to differentiate events and persons due to their own strong grasping/clinging on certain religious believes or ‘fundamentalism’. The result of fundamentalist grasping, which provokes a tunnel perspective, will be black-and-white patterns of perception. What NKT leadership / WSS and many of their ‘foot soldiers’ express says for me more about their state of mind and underlying believes than about the Dalai Lamas. However, happily I could witness recently two NKT people who break out of this pattern of black.and.white perception of the world. What a joy! What I dont get is why the NKT are focusing on the present Dalai Lama. After all, Shugden was banned repeatedly by numerous Ganden Tripas-shouldnt they be attacking the Gelug forefathers? The book turns a good deal of idle gossip, some of it true, into an even more convincing piece of evidence for those who propound the idea that the NKT are oneness with the CCP in Beijing. Same rhetoric, same hysterical attitude.Who would’ve thought that the hand of the Chinese Dalai lama hating regime would stretch thus far, dangling beneath it, the barely controlled movements of the NKT puppet. More profoundly, this striving for ‘perfection’ in a space or time where things are different from the present moment, indicates that what drives these people is not a form of Buddhist ideology but rather a childish grasping at one’s own one-sided perceptions, resulting in aversion and aggression to the present, and an infantile attempt to change things, to stamp their impression on ‘reality’. Oh dear NKT, do you think the Buddha was bothered about being ‘famous’ or ‘remembered’? Finally, if chanting slogans alongside Chinese critics of the Dalai Lama, slogans born of a campaign to change what you call a political decision by the Tibetan Government in Exile isnt political activity, what is? This book too, published by the NKT pretending to be the WSS is pure political diatribe (though the politics is not particularly subtle. If the Chinese did these things, their actions would be viewed as political. So how come the NKT claim they are a non-political organization? Isnt that in their constitution? That they wont do that. This also means that those engaged in this campaign are liars.And before you recognise this is ‘Ends justifies the means’ meeting, such is a prominent characteristic of New Religious Movements and …. (deep in-breath)..cults! Do Tibetan people living in India under the Tibetan Government in Exile have a free democratic society with freedom of worship, freedom of speech and democratic control of their government? What do you think? The Tibetans in Exile are in a transition of changing their system from ‘feudal with democratic elements’ (Charles Bell) to democracy. The main person who is strongly pushing that is HHDL himself, as far as I know he even ‘ordered’ democracy for his people, when there were to many objection in the TGIE. However, as Bell puts it, any change in the Tibetan Society must have his right pace and cannot be undertaken too quickly otherwise the Tibetans will be very unhappy. So now the great task to change the system from ‘feudal with democratic elements’ to mere democracy is in his first 50 years. Ask yourself how long Europeans needed to change their society from middle age to our modern time system, and how much you can expect perfections in 50 years only. Only based on thoroughly knowledge and historical perspective one can answer your question. Since I lack this, I restrain myself to answer this. I prepare a FAQ about Tibet/Dalai Lamas/TGIE etc which will be answered by academic experts, masters in their fields of knowledge, and I will put your question on that FAQ in one-two months or so the answer to your question will be online available. If you have more questions like these, they are highly welcomed. CHECK BEFORE YOU BUY – How to make sure you don’t squander your money. I want to make sure there was actually research done before investing any money in such a book. Otherwise, giving the WSS money to print more baseless allegations doesn’t make much sense, does it? Give me a list of sources and the academic researchers and first hand evidence used in the book. Just as one wouldn’t order a bushel of vegetables over the internet without first examining whether they were edible or not, it makes sense to check whether this book uses scholarly references and accounts by named witnesses that haven’t been seen before, or is another cloak and dagger effort by WSS. In which case, buying it would be a complete waste of time. Especially if the author refuses to name themselves. Just read the book, you cheapskate! Save your money and donate it for Haiti. Think differently… Buying useful books which overcome delusions is worth the money but to buy books which increase delusions is not worth the money. We agree about this principle but seem to disagree on the discrimination. Let’s talk again when we are both enlightened, and laugh about this day when we seemed to have reason to disagree! Yes, we disagree on the discrimination. It’s important to reveal harmful actions to benefit and protect others. Unfortunately, this book steps beyond this positive intention and makes dramatic statements full of judgment and “black and white” assumptions. I’ve practiced with the NKT for several years, and the tone of this book feels contrary to the extraordinary teachings, oral and written, I’ve received from Geshe Kelsang Gyatso. For instance, Gesha-la has taught we cannot know the motivations of others; yet, this book makes repeated claims to know the intentions and motivations of the Dalai Lama, asserting among other things that he constantly schemes to gain power because he is “self-serving” and a “troublemaker.” I’ve also been taught not to focus on the “faults” of others, but to look at my own delusions and explore the nature of my own mind. So I feel puzzled by the book’s extreme focus on the alleged “faults” of the Dalai Lama. It is one thing to present facts and exhaustive research in a clear, non-biased manner – from a place of wisdom and compassion; it is another to write what might read to a newcomer like some strange vendetta. It is one thing to reveal harmful actions; it is another to make personal attacks and resort to name-calling. *NKT use this phrase often to portray the state of the world…. I’ve just read the review that tenpel posted and you’re right, it’s such a joy to read something moderate and not overbearing (can’t say the same of the book though!). In fact, this is my first time on this blog and it’s more pleasant than a lot of the other sites out there…I’ll be coming back more often because you guys represent a refreshing change in view. Bearing in mind that I’m a practitioner, I thought I would like this book…but it turned out to be the opposite; it’s the one book I cannot bear to read. Having read and contemplated upon the book, I fail to see how the book achieves any of the four main aims in its entirety. I find a book that’s full of contradictions – it criticises the Dalai Lama for being under the Chinese payroll or being Communist, and yet almost praises the Chinese in other instances for liberating Tibet. It’s also very sneaky about how it portrays the Dalai Lama – on Page 216, for example, the wording makes it sound as though th Dalai Lama himself requested for the American troops. Thus because of how crafty the language is, I recommend everyone read the book with a pinch of salt. I find a book that takes advantage of some people’s poor understanding of Buddhist philosophy. For example, they label the Dalai Lama as arrogant for saying he will not bow to or take orders from Nechung. However, the Dalai Lama is commonly believed by Tibetans and some Buddhist practitioners to be an emanation of Buddha of Compassion (Chenrezig). Therefore, to protect their minds, it would not be proper for him to bow or receive instructions from a Dharma Protector. I find a book that imposes Western ideologies as the set standard of how to behave. For example, the authors deemed eye-gougings as a medieval punishment. It may not be right but the authors did not mention that Tibet was still very isolated as a nation during the time all these eyewitness reports were written, and therefore the judicial processes may not have mirrored those in the rest of the world. No doubt it is cruel, but the Tibetans lack of exposure to the rest of the world meant many of them were still stuck in their old ways. I cannot see how a book so vitriolic will restore peace and harmony, and re-establish common spiritual activities between Shugden and non-Shugden practitioners when it is entirely devoted to debasing the reputation of who the non-Shugden practitioners deem their inspiration. How does such a schismatic book establish any common ground in the sectarian division between Shugden and non-Shugden practitioners? 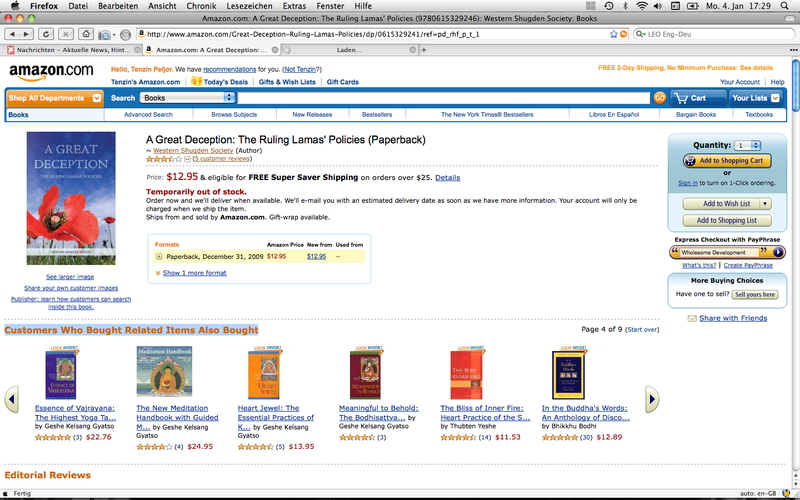 I cannot see this book will free Buddhism from political pollution. Half the book argues that religion and politics should not mix…so why was the book written, as it only adds fuel to the fire? How can it free Buddhism from political pollution, when its venomous nature and political agenda against the Dalai Lama mires it in politics? Okay okay, perhaps I could be a bit more generous – one aim this book has come a little close to achieving is being an example of the mess of politics. It is the perfect example of if you want to be a Buddhist, then let go of politics because it’s not a good mix. And there is information in this book that prompts thinking – for example the issue of combining four schools of Buddhism into one, the issue of nepotism and the issue of HH the Dalai Lama’s brother purportedly embezzling funds and engaging in arms trading. Therefore, I’m glad there is a book out there that supports Dorje Shugden, and I do think this book is very well-researched and supported by references (well except for Chapter 2, where cross-referencing is conspicuously absent). However, this book is so emotionally driven and intent on destroying the Dalai Lama’s reputation that it loses all credibility. Still, I do feel it’s worth a read, only if it’s balanced out with other sources of information because there’s a danger you may accept such an extremist view as the only view. For example, they label the Dalai Lama as arrogant for saying he will not bow to or take orders from Nechung. The reason why it is inappropriate for HHDL to prostrate to Nechung is, that Nechung is a mundane being, HHDL is a fully ordained monk and considered to be highly realised hence it is Nechung who prostrates to the Dalai Lama and not vice versa. From what ever level one looks onto the situation, from the Vinaya level HHDL as a fully ordained monk can not bow to a lay person, from Mahayana / Vajrayana perspective he is a master or Bodhisattva, it is appropriate for beings having faith, like Nechung, to prostrate to him. The statement of WSS is an example of not understanding basic Buddhist principles. HHDL does neither bow to a mundane being like Nechung nor does he take refuge in him, this would be against Buddhist principles. Who knows the Dalai Lama knows also that he is very humble. I find a book that imposes Western ideologies as the set standard of how to behave. What I read on the WSS website is often only full Western arrogance or prejudices. Charles Bell, who has a respectful approach to the Tibetans, says in his book about the 13th Dalai Lama that unlike the Christian Europeans the Tibetans have far more lived to their ideals than the Christians in Europe. Bell is a Christian himself. He makes also clear the fact that the Tibetans were a successful and brutal warrior nation who did not invade or made any war to another country after Buddhism became their main religion. Though such cruel deeds, as mutilation or torture, are highly condemnable hardly one can accuse the Dalai Lamas of being responsible for those nor may one have the creditability to do that as a European who were far more brutal to other beings. At least in Tibet killing or harming others was really seen as very bad. Gen Lobsang Gyatso writes in his auto-biography, that the 13th Dalai Lama forbade mutilations but certain Tibetans ignored the rules. Also only very few of the 14 Dalai Lamas had real power in Tibet. If they had power at all then often only for a short time and limited to Lhasa or Central Tibet. All this is well portrayed in Anthropologist Brauen’s book on the Dalai Lamas: http://www.serindia.com/item.cfm/161 or other reliable academic sources. The Dalai Lamas who had power in Tibet worked hard to increase justice, the rights of the poor and they fought against corruption, they were not bad or evil as WSS tries to misrepresent it but really tried to serve the Tibetans, hence the Tibetans called them the “Great” 5th, 13th (and quite likely also the Great 14th in the future). I agree also with you with respect to the Karmapa Controversy: the split happened in the Kagyue school among Kagyue lamas, HHDL only “interfered” when he was asked by Thai Situ Rinpoche and Gyaltsab Rinpoche. Also the far majority of Kagyue Lamas and Kagyue monasteries are supporting Thai Situ Rinpoche’s candidate, their decision has nothing to do with the opinion of HHDL but is their own free decision as it is the free decision of Shamar Rinpoche and a significant minority of Kagyue Lamas and Kagyue monasteries to support Shamar Rinpoche’s candidate. Is chapter two written by Ron Cook? What I read of him on a WSS blog was full of misunderstandings and personal bias. With respect to the claim that HHDL tries to unify the four Tibetan Schools to place himself as the head, I doubt this because it won’t function nor is there a need for such an action. Maybe it was the idea of the brother of the Dalai Lama and he may have thought it would be the Dalai Lama’s intention; but neither is there a need for doing this nor is this possible from a practical or spiritual perspective – its completely unrealistic to have such an aim. This can be easily understood if one understands a bit the four Tibetan schools and their lineages. Such a vision may be rather based on fundamentalist visions as they have been felt by the most conservative Gelugpas – like Pabongkha – but not by HHDL. However, to clarify this point I put that claim on my six-paged questionnaire which I send to a Tibet expert in the US. I hope soon there is a qualified answer available also with respect to this point. This is solely gazoksas’ misreading of that section of the book. It simply explains the subordinate position of Nechung as a matter of fact; there is no claim that Nechung should be on par with the Dalai Lama. @dharmaprotector – I’ve just had a reread and in the context of that chapter (and in the context of how they continuously label the Dalai Lama as arrogant! ), I still think the WSS meant it as they wrote it. “With this attitude, it seems highly unlikely that the Dalai Lama will ever bow down to the will of the people…” – what attitude are they referring to? They’re implying that if the Dalai Lama is too arrogant to bow to Nechung, he won’t bow to the people. So no dharmaprotector, I don’t think it was a misreading. They may not have been trying to claim that Nechung should be on par with the Dalai Lama, but they were definitely trying to play with the language, to add to their argument that he is arrogant. That I consider sneaky, and that I don’t think is the right way to support Dorje Shugden. @tenpel – I would like to see the answer to that point as well! I don’t think there’s any need for it either. The WSS claim he’s doing it because he’s only really a figurehead leader and therefore is deign to lose power should he go back to Tibet. ‘Figurehead’ meaning the Karma Kagyu’s true spiritual head is the Karmapa, not him; the Gelugpa’s true head is the Gaden Tripa, not him, etc. So they say that he wants to consolidate his power, in case he returns to Tibet, so he can rule everyone…but that in itself is a little contradictory? 1) By the WSS’s own admission, he’s also doing everything to sabotage Tibetan independence. 2) Given the current situation, with or without His Holiness’ supposed interference, it seems unlikely the Tibetans will ever regain Tibet in this Dalai Lama’s lifetime. Therefore this Dalai Lama may never see the benefits of what he’s supposedly trying to achieve. So why even bother to try and unite the four schools if he may not see the benefits, and if his successor may not even follow the same policies as him? In A Great Deception, the WSS themselves show the Dalai Lamas did not always implement the same policies as their predecessors. Such a big book of contradictions. Pity – they had a big chance to educate people about the ban, and give real support to Dorje Shugden. Instead they chose to deny themselves credibility by becoming so caught up in destroying someone else’s reputation. The Dalai Lama, Nechung, and the Kashag (Cabinet) all have the same responsibility towards Tibet, but different functions (Freedom in Exile, p. 212). The Dalai Lama takes advice from both Nechung and the Kashag. However, if it is for Nechung to bow to the Dalai Lama, can it not also be said that the reason why democratization has been so slow is that “it is for the Kashag to also bow to the Dalai Lama”? Playing with language perhaps, but also maybe just reading between the lines. if it is for Nechung to bow to the Dalai Lama, can it not also be said that the reason why democratization has been so slow is that “it is for the Kashag to also bow to the Dalai Lama”? Playing with facts is always a good means for propaganda or to distort things…. It was the 14th Dalai Lama who praised democracy and started to convince the Kashag and Tibetans to install it making known to them that democracy is not contradicting Buddhism. HHDL, against the opposition of the Kashag, installed the rules that the Dalai Lamas can also be stripped from political power or an impeachment can be issued against him. If you read Sir Charles Bell you should have noticed that he warned that reforms in the Tibetan community must be implemented carefully and slowly otherwise, Bell says, Tibetans will become very unhappy. So, the motor of democracy is HHDL and the speed it can be applied depends on the Tibetan community. However, following a distorted version of history and relying on a biased reading of reliable history sources one won’t get the facts as they are. The great Dalai Lamas, like the 5th, 13th and the present one were and are respectively reformers for the better of the whole Tibetan society. “The hate of Buddhism, Tibet and the Dalai Lama is immediately evident in this so-called book. It was written and is being promoted by a controversial cult based in England founded by a discredited renegade filled with envy who has long wanted the removal of the Dalai Lama as a highly regarded religious and political leader. The book recasts various facts into the most negative and absurd interpretations possible in order to make a political statement against a respected spiritual man and head of a state in exile from its homeland (Tibet) after a communist invasion during the 1950s. The cult promotes that the Dalai Lama is a fake Dalai Lama, that he caused the demise of Tibet and Tibetan Buddhism and that the world’s admiration for him, his Nobel Prize for peace and all his accolades are a scam. 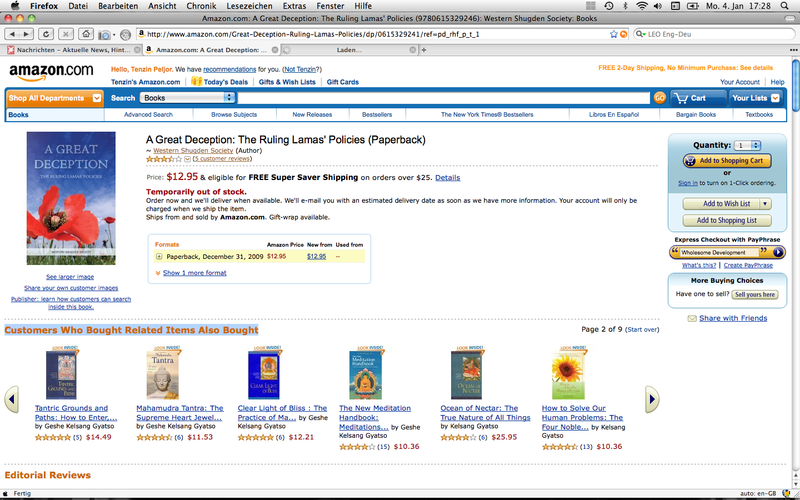 Fortunately, the far larger number of books about the Dalai Lama available, including here on amazon.com, present a far more accurate and useful perspective. The book is a remarkable psychological anatomy of a cult desperate to spread hate as its religion. Obviously AMAZON has no problem to spread such a hate book but problems with criticism that state what the book is, a hate book. If comments have indeed been removed, they would have been removed either by Amazon or by the author. Either would only remove them if they felt they were unfair or untrue comment. They would not remove them merely by request, for this would place them at the mercy of fanatics and pressure groups and destroy the usefulness of the Amazon review system. Since it’s unlikely that Amazon are biased against the Dalai Lama, the conclusion is obvious: these criticisms were wrong. Amazon.com removed different reviews by different people sometimes from the same reviewer different times too – including my own reviews. After complain they wrote that they deleted my review because this would rather be something for the forum/discussion, so I put it there. Why I assume that NKT is requesting Amazon to remove unwelcomed reviews is that NKT has a long history of repressing unwelcomed criticism by threaten to sue people. In my own case NKT complained to WordPress, to Flickr to get my accounts removed. In the past they were successful in deleting complete threads on different forums like beliefnet threatening the forum to sue them if they don’t remove the threads. They also threatened academics to sue them if they publish certain information. Not to speak about how unable they are to accept criticism from own members…. Yesterday Amazon.com had 11 reviews, today there are only 9. Two 1 star reviews were again deleted. Its amazing to see that Amazon can tolerate a book which libels a living person but is not able to bear reviews or discussions which state what the book really is: deluded perception of fanatics. 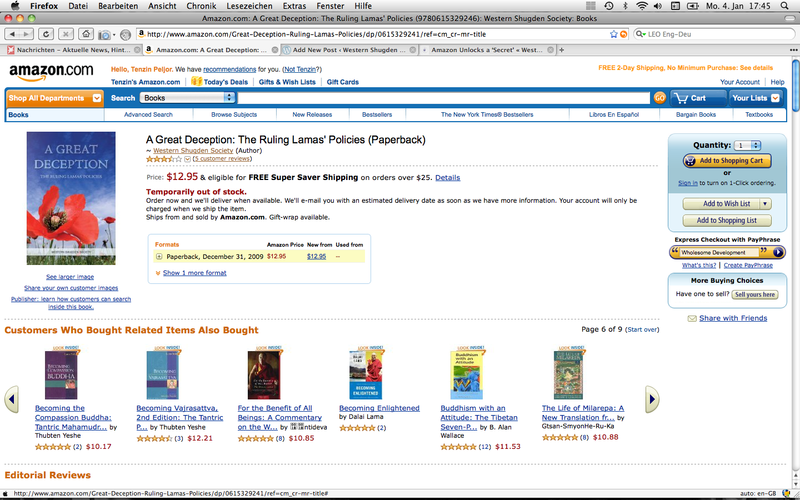 However it appears to me Amazon.com also forced WSS to rephrase their book description. Finally all this is Amazon’s business or policy; I know from two other cases with respect to cult/anti-cult stuff that Amazon seem to be more tolerant with the books they sell – no matter how slandering they are – than with frank reviews about those strange books. But maybe I am wrong here, is just a superficial impression and maybe I am injustice to Amazon… There seems to be also a difference between Amazon.com and Amazon.co.uk, though in UK the libel laws are very very strict, Amazon.co.uk can accept reviews which were deleted by Amazon.com. I suspect the reason why the review was removed is that it mistakenly(? )associates the NKT with the WSS which is incorrect. The WSS is a coalition of Dorje Shugden practitioners who oppose the ban of the practice by the Dalai Lama and includes Tibetans as well as Westerners. I suspect the Dalai Lama’s supporters want everyone to think that the WSS is only the NKT in the same way as they would love everyone to think that NKT is a cult, then they’re got someone to blame. It’s subversive propaganda. Kelsang Gyatso ordered to found NKT and his devotees followed his order – those who didn’t, like Lucy J., had to face the loss of their position within NKT. Now Lucy has to earn enough ‘merit’ to get her position back by spreading diligently NKT’s agit prop all over the internet, including Wikiepdia—at least this is what NKT insiders reported. Funny that the most active person spreading misleading NKT propaganda, ‘lineageholder’—whom I assume to be Lucy btw, denounces the facts to be “subversive propaganda”…. I have re-read that (very long) chapter 3 times now, and can see no instance of calling the Dalai Lama arrogant, or words to that effect. Can you provide a page reference? I think that most corporate lawyers would advise that comments need to be unjustifiable in order for their author to be worth suing. This suggests that the 1-star reviews contained actually libellous (i.e. unjustifiable) content. Whilst I agree that the book does seem to throw everything it can at the Dalai Lama’s reputation, and that this is also true of the deleted reviews, I would guess that legal advice has shown the reviews to be definitely at fault in that they throw stuff that isn’t true. It is actually possible that the book is broadly accurate and that criticism of the NKT is broadly mere demonisation. Although I am aware of real problems in the NKT – especially mental bullying, arrogance and sexual misconduct by those in authority – these are not the only accusations levelled by pro-Dalai-Lama reviewers. Neither is it truthful or fair to pretend that these matters are specific to the NKT, which is an overwhelmingly reasonable and pleasant environment to visit, like most Buddhist organisations. By the way, could a Dalai Lama supporter tell me where is Tibetan democracy? It seems to me that there is more in Tibet than in the exile community. By the way, could a NKT supporter tell me why they are so ill-informed about the state of Tibetan democracy, Tibet, the Dalai Lamas and China? It seems to me that there is far more knowledge outside NKT than in the NKT community. No, not short on answers. I was thinking it is the wrong way to give the information to NKT followers over and over again. Everybody can find accurate information if he really wants to have them. I was thinking: ‘It is your work to be done to get a good understanding on it, not my work.’ That’s why I refused to answer. Why am I responsible for the lack of information of NKT followers and should invest so much work to give information which is available if one really is looking forward it? However, if you really wish, I would give you a summery of what I know. This saves also some time for you. But if you wish to involve me in a polemical dispute, sorry, I have no time for this.